IT wasn’t a typical weekend in Phnom Penh last Saturday. Hundreds of people – all thrilled and excited – gathered at the Chaktomuk Theater to witness for the first time the beautiful and mesmerising royal ballet performance “Neang Watthana Devi”. Kennories rescue Watthana Devi after she fell from the mountain when the two gods were fighting for her love. As traditional Khmer musical instruments played and talented singers sang beautifully from the corner of the stage, a young, attractive Neang Watthana Devi and six other ladies, clad in intricately embroidered costumes and their heads accentuated with red flowers, entered the center stage and let their bodies and hands move in harmony with the music that echoed around the theater. All their dance steps – executed so gracefully – looked slightly different from the usual style of the Royal Ballet. The beauty of Neang Watthana Devi causes the Goddess Raki to feel really jealous. She then orders God Samiddha to use magic and make Devi fall in love with Sambali, the God of Garuda. But when God Samiddha sees Devi’s face, he, too, gets captivated and falls in love with her. He then decides to transform himself into a gold-masked man fighting against Sambali. While the two gods are fighting, Watthana Devi falls from the mountain. Luckily, she is rescued by Kennories who drops her to the place of Samiddha. This is where God Samiddha confesses her love for Devi, but he still has to keep his real identity behind the golden mask. Watthana Devi’s two sisters get so jealous that they convince Watthana Devi to kill the golden man who is telling her a lie. But before Watthana Devi successfully kills the golden man, he wakes up and get furious with what Devi has planned to do against him. He decides to leave and disappear. Driven by her bad motives, Goddess Raki gives a little box to the repentant beautiful Devi and tells her that the box will help her find God Samiddha. Unknown to Devi, the box will cause her to be in deep sleep. Seeing the trouble Devi’s facing, God Samiddha uses his magic power to wake her up and brings her to heaven. He introduces Devi to Indra, the King of Gods. Indra orders a grand wedding celebration for the two good-hearted people. Indra also welcomes Devi as an immortal goddess and gives blesses the couple with a beautiful baby that signifies the pure love between God Samiddha and Goddess Watthana Devi. 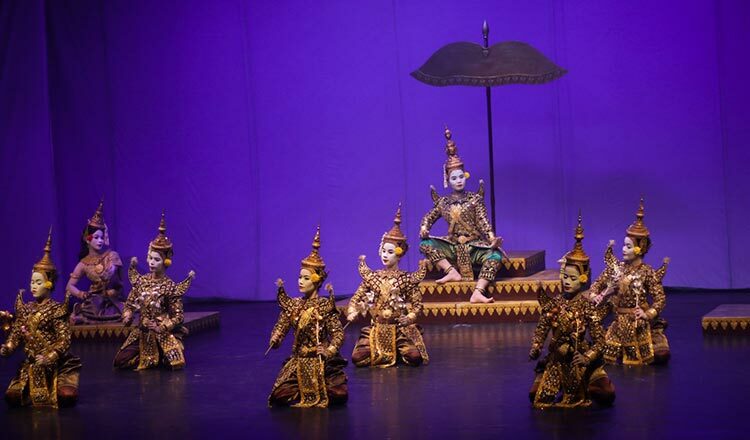 As the story came to an end, traditional dancers emerged on the stage with an image of the Preah Vihear on their background. But the entire performance wasn’t just meant to tell the story of Watthana Devi. It also was a tribute to the famous French sculptor Auguste Rodin, the first saw the aesthetics of Khmer dance in 1906 and was immediately stunned by the passion and enthusiasm of the Cambodian art. Rodin made more than 100 drawings of the ballet poses. In a press conference last month, Prince Tesso Sisowath explained that Neang Watthana Devi is a new story writen and choreographed by Princess Norodom Buppha Devi. 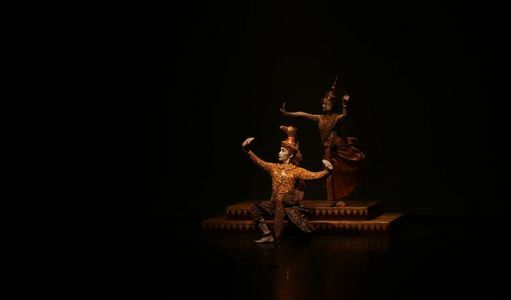 The concept of the production was originally raised by Zaman Production head, Jean Herve Vidal when he saw the creation and revival of ballet from King Sisowath’s reign, “Memories in Motion” in 2016. Vidal suggested to the princess that they can celebrate the historical meeting between the famous French sculptor and the royal ballet dancers in 1906 by creating a new ballet inspired by the Greek myth of Psyche as Auguste Rodin. Rodin used to compare Khmer civilisation to Ancient Greece. With the support and assistance of Lok Kru Proeugn Chhieng and Neak Kru Soth Somaly, Cambodia adapted the legend of Psyche and the people behind the ballet production wrote a story, composed songs and music, created new costumes for a grand ballet performance. It took Princess Buppha Devi and the production team one year to complete the research, training, writing and costume embroideries for the one hour and 40-minute show on January 18 and 19 at the Chaktomuk Theater. God of Garuda, Sambali, tries to convince Neang Watthana Devi to love him back. The impressive performance could have not been shown without the strong supports of art and ballet enthusiasts, students and local and foreign guests that showed up at the theater. 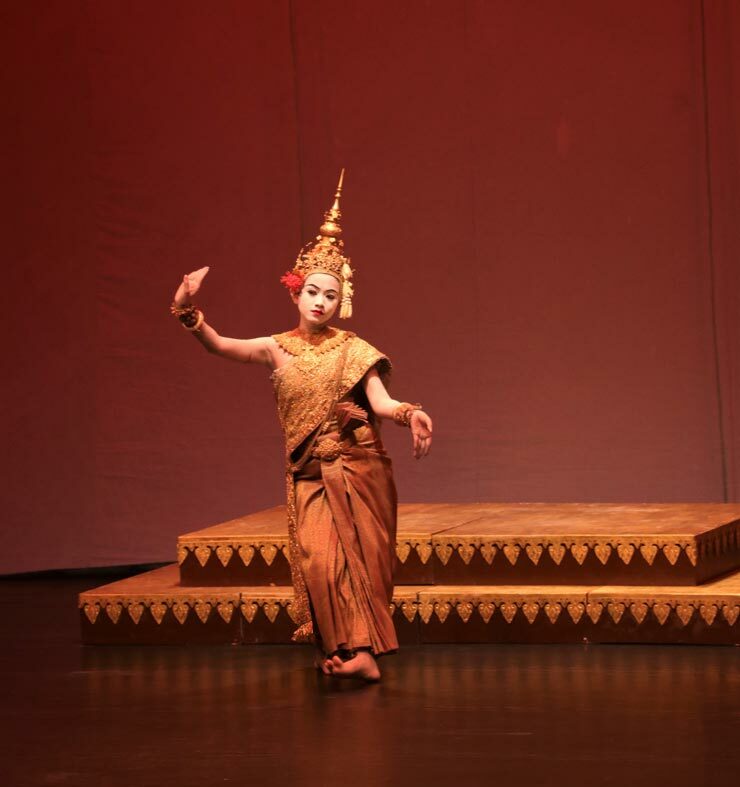 Though Hoy Leakhena is currently studying architecture at Norton University, her passion to revive Khmer arts stayed with her all through the years, and was even fired up as she witnessed the royal ballet for the first time. She acknowledged that royal ballet has never really been made public. Young people barely got opportunities to witness it in the last few years. “I volunteer to take even a small part of this performance by helping to welcome people and find their seats for the two-day show. Through this volunteer work, I have witnessed the performance through my own eyes and it was really impressive. I want to see this performance more often and I am hoping that more people will love it because it’s part of our identity as Khmer. Like Leakhena, Huot Lyhong also volunteered for the theater show. He helped performers with their costumes and props. He gave all the help he could extend as he knows that most of the trainers of the show are already old. He is also proud to have wide knowledge on the story and history of the ballet. Before talking deep about the performance, Lyhong explained the roots of Neang Watthana Devi performance. He said it was originally and primarily performed for the king of Cambodia and it was not shown to public back then. But after bringing the performance to Switzerland and France, the performance as inspired by Psyche and as a tribute to famous French sculptor Auguste Rodin, more people showed interest to have it in Cambodia. Though it is undeniable that the performance is rarely seen in the country, Lyhong said that the young generation can always find a way to revive it and bring back its glory by supporting artists and spreading the information to raise public curiosity. 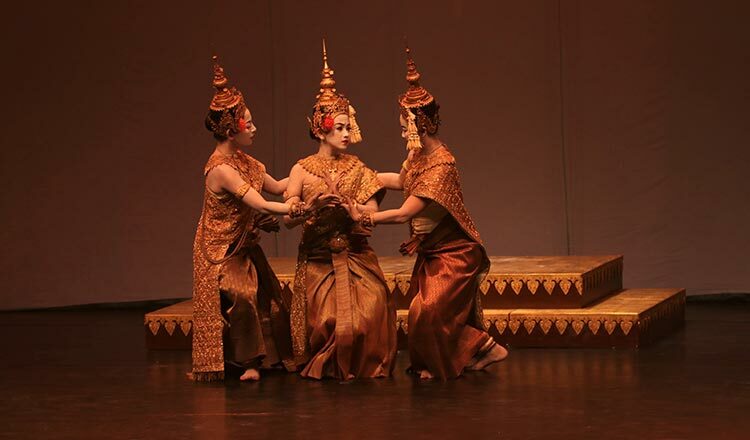 Through such, there will be a wider and deeper understanding on the value of the Royal Ballet of Cambodia. “Cambodian people who are supporting old forms of arts are considered old fashioned. I prefer to call it freedom of thinking and choosing what they want to support. But this art it is part of our history and a symbol of the nation’s spirit. Don’t forget that foreigners got to know this country through arts! And if you don’t know your history, you will likely repeat the same mistakes,” Lyhong said.